You know that feeling when something that you’ve been anticipating for ages gets pulled at the last second? That just happened to me, twice. Callie and I head out this past week for the summer’s big Sierra hike, full of anticipation for a trip that was set to offer amazing photographic possibilities, as well as a lot of fun offtrail travel. It was bound to be one of the biggest adventures of Callie’s lifetime; a very ambitious journey to take a dog on that would have acted as a validation for some of our training and experience. Well, none of that happened, and instead we faced a series of setbacks that eventually sent us back to Altadena 4 days into the trip. We started our trip at the Pine Creek trailhead at noon on a Monday. Ideally, we should have been on the trail first thing in the morning, but I had opted to stay in LA the previous night to get over a lingering cold. Since the trailhead rests at 7500 feet, such a late start could prove to be very unpleasant on a hot day on the exposed trail. However, we were fortunate in the fact that there was steady cloud cover in the sky which made the hike up much more temperate. The entire stretch of trail up to Honeymoon Lake is a repeat of Callie’s first backpacking trip, which we did just a year ago. Since we had already spent some time photographing and writing about this stretch of trail, I didn’t stop to take many photos, but here are a few from the trailhead to Pine Lake. That’s the last photo I took on this section of the trip. We continued on past Pine Lake and eventually found ourselves at Honeymoon Lake at 5PM. The intended destination of the day was Granite Park about a mile and a half further up. The clouds had been consistently grey and overcast all day long. I knew that storms were in the forecast, but there hadn’t been any recent action that made me think that conditions were about to change dramatically. I made a calculated decision to press on up the hill. About 15 minutes later, the skies opened up and a violent hail storm started beating down on me and Callie. We were on a granite slab at treeline, with no cover or flat areas nearby. The only viable option was to hastily retreat to Honeymoon Lake and get the tent set up. We moved back quickly, but also carefully considering the suddenly slick granite rocks covering the trail. The hail was about the size of peanut M&Ms, and each of the many that hit my head was mildly painful. Poor Callie was getting pelted and just followed right behind hoping that I knew what to do. Back at Honeymoon, I tried to find a flat spot with some cover to set up the tent, while also being mindful of not placing it in an obvious flood zone. Callie dove into a bush, still with her pack on, to get a little respite from the storm. 10 minutes after it had started, the hail was still coming down as violently as any hailstorm I’ve seen. I’ve never had to set up my tent in such violent conditions, so I was a bit panicked. By the time I got it set up, which was still fairly quick, the inside of it was pretty wet and meanwhile I had left my pack out exposed to the elements. I carry a dry bag but foolishly did not use it, as I was rushing to get the tent set up to help prevent Callie from getting utterly soaked. Once I got the tent setup, I quickly threw all the gear into it and we got in and started trying to dry off. Meanwhile, the downpour changed from hail to rain, and water began flowing down from everywhere from the melted hail. Up in the High Sierra, there isn’t a lot of soil to absorb this amount of rainfall, so it’s pretty easy for flash floods to occur. The spot I had hastily chosen for our tent turned out to be inadequate. A side river formed and ran directly underneath the tent. I wasn’t about to test my Big Agnes Fly Creek’s ability to stay dry when pitched in a moat, so back into the rain we went. By the time I had gotten it set up again in a more suitable location, it was a wet, dirty mess. Most of my warm gear had stayed dry, so I was able to keep both of us warm, but sharing a small dank tent with a wet dog and a bunch of dirty gear is an unpleasant exercise in patience. Unfortunately for me, the rain did not subside for the rest of the night. While the monsoonal downpour only lasted for about an hour, the rain was constant, and every hour or two it would resume to a full downpour. To top it off, throughout the night there were lightning strikes from surrounding areas lighting up the top of my tent. While there were no nearby strikes, it was hard to get much sleep knowing they could move my direction anytime. This storm’s lightning strikes started over a dozen nearby wildfires over the course of 24 hours, the effects of which we would see firsthand a few days later. To provide some additional perspective on the force of the storm, during that same period the Alabama Hills in Owens Valley received 1 1/4 inches of rain. It averages around 6 inches per year. When I woke up the next morning, it was still raining. Looking out my tent, it was completely overcast and a break in the weather did not appear to be coming soon. Additionally, the terrain above Honeymoon Lake is mostly granite, and the prospect of hiking it in these very wet conditions seemed uninviting. I made the decision to retreat back to Owens Valley to dry my gear and come up with a Plan B trip. It was hard to pull the plug on this trip which I had been happily planning for months, but it felt like the wise choice. I emerged from the tent to a swamp like environment that looked more like a refugee camp than a pristine Sierra backcountry campsite. Packing up the site provided some unique challenges due to how wet much of the gear and surrounding environment was. All of the wet and nasty gear went into Callie’s bag, naturally. I had skipped dinner the previous night and didn’t even bother with breakfast. The scene was too bleak and uninviting to linger. We headed down the trail to Owens Valley with the hope of a fresh start on another big trip. My camera appeared to be fine, but it was still a bit moist so I did not take any photos during the descent. Back in Bishop, we got a hotel and I got a permit for Piute Pass the following day. This new trip would only be about 10 miles away from the last one, as the bird flies, and it would even cover a few of the same areas. I was very excited and optimistic about the next week in the High Sierra, despite our initially planned trip ending abruptly in failure. So, with dry gear, full bellies, and renewed spirits we returned to the trail. We were back at the North Lake trailhead where we had been only a few weeks previously for our trip to the Wonder Lakes. 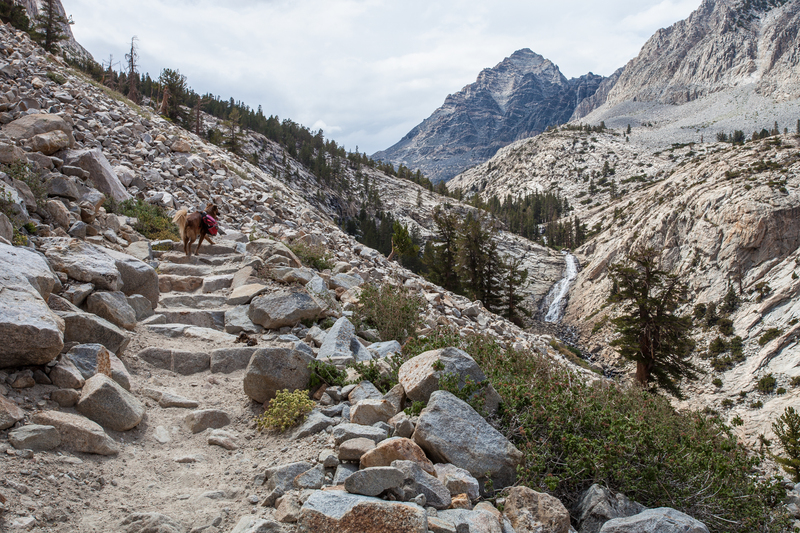 This time, we were heading up the Piute Pass trail. The only time I’d ever hiked this trail was a day hike to the pass with Riss 5 years ago, so I was very excited to return to it and explore the west side of the pass. The first part of the trail moves along the North Fork of Bishop Creek. The rushing water, frequent wildflower displays (if you time it right), and occasional open mountain views make it a stunning stretch of hiking through the woods. The forested stretch doesn’t last long though. Soon enough, the trail is mostly devoid of trees as you ascend towards Loch Leven, and views of the surrounding peaks open up in every direction. Welcome to the High Sierra. Upon reaching lower Loch Leven, Piute Pass comes into view. From here, it looks like there is still a long journey left to the top, but it’s only 700 feet above the lake. No problem. Loch Leven is a series of small lakes tightly connected through streams and waterfalls. The trail goes right along the shore of each one and stays relatively flat for awhile. The clouds in the sky were pretty thick for mid-morning, so we didn’t linger too long. After our experience at Honeymoon Lake, I wanted to make sure we arrived at our campsite by the early afternoon. 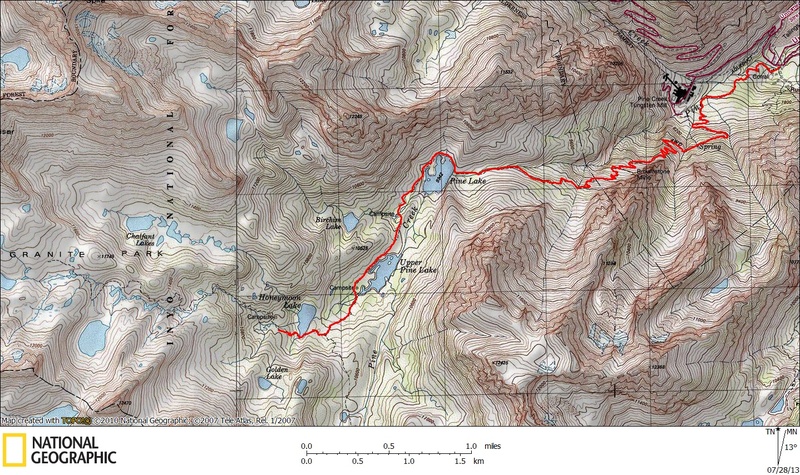 We quickly pushed past the remaining Loch Leven Lakes and Piute Lake above and before too long reached Piute Pass. Perched up on the saddle, we had great views in both directions. Piute Lake dominates the view to the east. To the West, Summit Lake provides the foreground to a breathtaking expanse of alpine wilderness. The terrain to the West is predominantly a high elevation plateau surrounded by peaks. It feels like cheating to be rewarded with such epic views while strolling down a flat trail. I could meander around here for weeks, and probably will over the course of a lifetime. Our destination for the day was Humphreys Basin. There is a use trail that shoots north off the main trail, but there is no sign at the intersection. Either way, offtrail travel here is easy so it’s not a big concern as long as you have some navigation skills, which is recommended if you enter this area. We opted to go to Lower Desolation Lake, which is a bit off the use trail that goes up to Desolation Lake. Here is what the terrain looks like between the lake and the use trail. Off-trail travel here is relatively straight forward and pretty much any route you choose will work. Callie had a great time hopping around the rocks and running on the many grassy patches. The Aspen Fire started on July 22nd near the Kaiser Wilderness, about 25 miles west of where we currently were. The cause of the storm was a lightning strike from the same storm that caused us to retreat from the mountain on our first try. Now, it was driving us off the mountain once again. The smoke was so thick that Mount Humphreys and the Glacier Divide were completely obscured. Not only was photography pointless, but even trying to go around and find compositions to shoot during better conditions was a futile activity. Even basic orienteering was difficult in such smoky conditions, so there wasn’t much choice other than to just hang out by the camp. While I read, Callie kept a very close eye on a nearby encampment of marmots. This was my view for the next few hours. There was something surreal about the predicament as well. Being in a remote place, where the landscape is naturally pretty barren, with these conditions made me feel like I was in some sort of apocalyptic movie. I half expected a band of roaming marauders to show up and demand my instant mashed potatoes and bourbon. The following morning, the basin had been cleared of most of its smoke. Or, it seemed to have risen at least. The sky had a thin layer of haze which cast a soft diffused light on the landscape. The conditions were finally decent, but I fully expected that to be very temporary. I had already made the decision the previous night that I was not interested in lingering in the mountains when such bad visibility would continue to be likely, especially considering the fact that I was solo and my family was waiting for me at home. We packed up our camp and began heading back to the trailhead. It was very sad to be leaving such beautiful country prematurely. Before too long we were at the pass and back to the frontcountry. All downhill from here! Even though I didn’t question my decision to pull the plug on the trip (the area did get smoked out for the next few days), I couldn’t shake the depressing feeling that the whole trip had resulted in failure. It’d be at least a year before another opportunity like this popped up. As we descended back to the car, I spent some time beating myself up and making my already foul mood worse. Fortunately, I had Callie with me who is always a positive reality check. She was having a grand old time hiking down and greeting each hiker that we met with cheer, proving once again why she is the best hiking partner. No human could possibly match her limitless enthusiasm for the trail. We’ll get her out for that big adventure eventually. Well, that is disappointing. Sorry that Mother Nature wasn’t more cooperative. On the plus side, you did take some incredible pictures! I was at Henry Cowell Redwoods State Park today. Foggy morning gave me very flat looking pictures. The redwoods, as always, were spectacular. I did notice that a lot of people (7-10) had there dogs with them on the trail. So, if you are ever in Northern California, look this state park up! I’ll post some pictures on my blog this week. Incredible photos Brian. Sorry the trip didn’t go as you planned but from where I am sitting it sure looks like a success. Well, you got a couple of days of hiking, some decent pictures and some time outside. Not a total failure. And I’ve never experienced hail, so now you can check that one off too. Hope Phish lifts ya. We were up at Pine Creek / Honeymoon lake this weekend and got clobbered by thunderstorms in precisely the same way: hard rain, big hail, then our tent in a run-off puddle. Had to jump out bare-chested (didn’t have rain gear!) to move it to high ground, all amongst deafening and incessant thunder. Lingering haze and smoke kept the views from their full glory too. Oh well, next time will surely be better. Seems like that went for all of us. Our trip to middle Palisade got turned around after the first night of 12 hours of rain and we were not the only ones turning around. Then a flash flood stopped traffic on 395 for 2 hours. But we are alive and safe to go out and try it again. Thanks for sharing. Sorry it didn’t work as planned. My buddy Wylie commented up above and I was there with him last weekend. We actually found out about this trail thanks to your blog. I was searching for dog friendly California hikes and stumbled across yours. Small world that you just happened to be there the same weekend we were there. My dog Artie wasn’t at all affected by the thunderstorms, but it was pretty intense. The hike up that trail is pretty brutal. A real slog, but the lakes were beautiful. I’m going to bookmark your page. I can no longer hike due to the condition of my knees and don’t really want to have replacement surgery because I’ve had to have others surgeries I had no choice in. 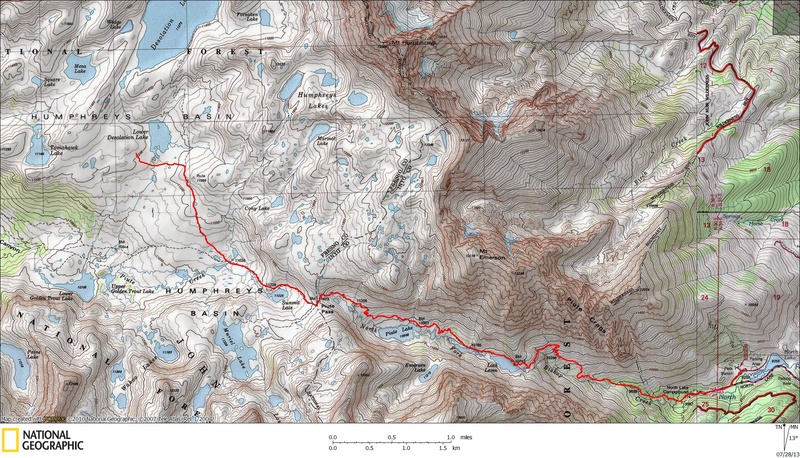 Anyway, I’ve hiked a lot in my years and should be satisfied with where I’ve been and the experiences I had. I just didn’t think the activity would come to an end at about 60 years old. I’m taking it gracefully by returning to an activity that is both good for my knees and that I’ve been passionate about since the age of 13 and that is long distance bicycling. I enjoyed this trip report. I live in Mammoth and before that Bridgeport with my total time in Mono County at over 32 years. The smoke from the Aspen Fire last summer was debilitating. My wife and I stayed indoors for 3 weeks or more. The smoke was moving up canyon in the San Joaquin River drainage, over Mammoth Pass and Minaret Summit and right into town. You were wise to leave as the smoke got worse than what you experienced, although as far south as the Humphrey’s Basin it might not have been as bad. We had to keep all our windows shut with fans going nearly 24 hours to keep from being exposed to the smoke. I love seeing the pictures of your dog. Your site is of excellent quality, your writing interesting and your photos are superior. Thanks for this site. I will hike along side of you vicariously! I should add that we experienced the smoke of the Rim Fire for 2-3 days, but were, for the most part, spared. That smoke passed to the north of us into Bridgeport and Reno and points in between. We had a week to 10 days of smoke from this year’s (2014) French Fire and had to go back into the closed house, nearly 24 hour fans running mode again. The French fire is burning immediately down canyon from the Aspen, but has not burned as much acreage. Between last summer and this one it is easy to understand why people such as yourself want to leave. I feel lucky as the bike riding in the eastern Sierra is some of the best in the country. I have to blink a couple times an hour to believe that I’m lucky enough to ride where I’m riding with such incredible scenery. That partially mitigates my thoughts of those trails, peaks and valleys I will likely never get to now. Life just changes our plans to quickly! What was your intended itinerary? I would love to plan a very similar trip! My rhodesian and I love to backpack!